User authenticates with his smartphone in less in a second. Use an openid account from a single sign-on manager instead of RFID badges or keys on your access control. We all have smartphones. Improve authentication speed. No specific badges or keys anymore. 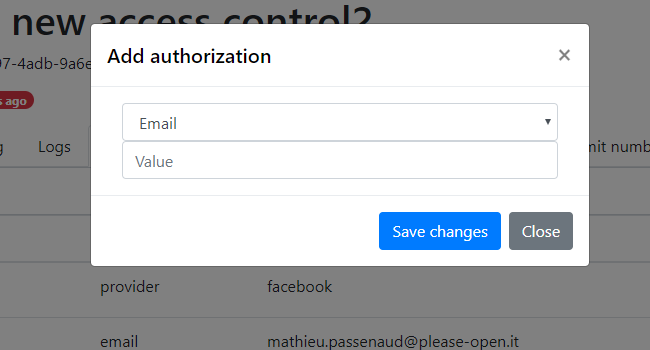 Keep a hand on authorizations, define fine rules for each user. Poximity is the best security. Scan a QRCode on the smartphone screen instead of type a 4 digit code, like you do in the airport with your flight registration ! You can also use bluetooth LE ; each smartphone has bluetooth builtin, so everyone can use it. There nothing to prove : OAuth2 is the best authentication protocol and the most use on the internet. Use this protocol for your own access control. With or without app ! Manage hours, special access or any filter you need. Connect to your controller a standard relay board. You can add please-open.it as a new authentication provider on your door, keeping existing systems in place. Any question ? Want more information ? Follow us on twitter or you can reach out to us via email.